If you’ve been holding off on purchasing an electric scooter, this may be the beauty that you’ve been waiting for. The Mini Scooter E by BMW is a retro plug-in electric vehicle inspired by the Mini Cooper, just unveiled today in London. Each of the E Series’ three scooter designs will feature the same circular instruments and speedometer found on the famed vehicle, and a lithium ion-power source. Not just an attractive ride, the scooter has a handful of impressive add-ons, including a smart phone docking station that unlocks the vehicle, GPS software that scans for nearby Mini Scooter E’s, and a helmet with an integrated microphone and headphone set that allows riders to listen to music or use their phones while driving. The scooter’s GPS system even triggers the vehicle to flash its headlights when passing another Mini Scooter E on the road. BMW hasn’t revealed exactly how much the lithium ion-powered scooter will cost, but it’s estimated that they’ll be priced at over $6,000–significantly more expensive than standard scooters. BMW took a people's MiniCooper and turned it into a Rich only car,why not do the same to the scooter...What a shame. This is fantastic product. Very useful. Mini should develop a lightweight sports recreational 2 wheel drive all terrain mini electric scooters that can be carried around and about in a car boot just like the mountain bike. Easier to do an electric 2 wheel drive scooter than one using the conventional engine and it does surf its purpose well.. If you've been holding off on purchasing an electric scooter, this may be the beauty that you've been waiting for. The Mini Scooter E by BMW is a retro plug-in electric vehicle inspired by the Mini Cooper, just unveiled today in London. 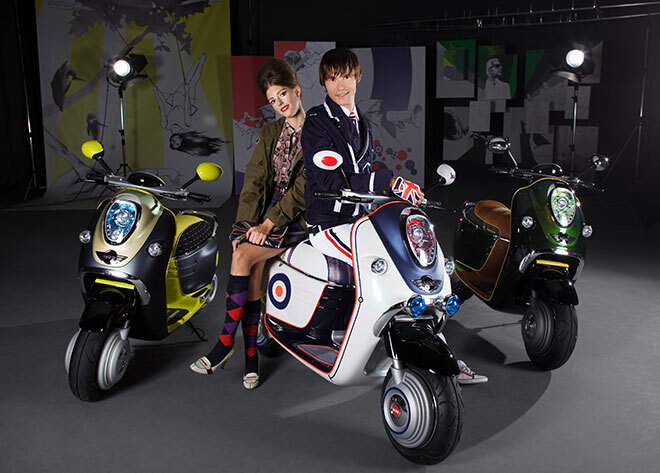 Each of the E Series' three scooter designs will feature the same circular instruments and speedometer found on the famed vehicle, and a lithium ion-power source.